It is quickly replaced by fast food odors, outdoor smells that have seeped in, and if you have pets, that distinct doggy smell that is very difficult to get rid of. Now, while car freshener is the only thing that can really relieve this assault to your senses, you may find it a bit tough to find which product actually works. You need a car freshener that can mask or eliminate bad odors. While some brands do a wonderful job of this, there are others that simply mix with the scents that are already there, creating an even worse scenario for you. Well, we decided to be the guinea pigs and find the best car freshener so you won’t have to go through all that trouble. The reason that this Ozium car freshener is a little different from others is because it eliminates rather than just mask odors. This way, you can be quite sure that any scents that are lingering in your car will be completely erased, leaving it smelling clean and nice. The car freshener comes in especially handy for people who smoke in their car – the scent completely clears out the smell of cigarette smoke. What’s more, because the scents come from a gel-like substance in the car, it works well even in high temperatures. This is because the gel doesn’t melt and continues to give off a steady scent at all times. Yet another feature that is great about this freshener is that you get to control how much scent is let out. See, it contains an adjustable twist top which lets you determine whether you want a gentle or stronger odor. However, this freshener works best in small vehicles and you may find that it is just not adequate for a larger vehicle, such as a van. Also, this isn’t a freshener that lasts too long and you may have to replace it quite often if you want to keep your car smelling fresh. One of the things that really stands out about this air freshener is the great scent that wafts out of it. It doesn’t just smell good, it also has a clean and crisp scent which ensures that your car smells fresh at all times. The reason that this air freshener has such a great fragrance is because it is a tantalizing mix of bergamot, sandalwood, and lemon. Using it as a car freshener is really simple as well. All you have to do is to take it out of its packaging and simply hang it on your mirror. After a while, the scent will eliminate all other odors, leaving a pleasant fragrance. You should be able to use it to get rid of cigarette smoke and even your pets’ scent. 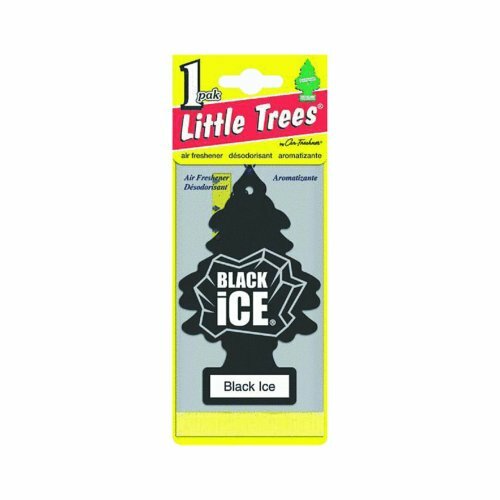 At the same time, you won’t feel overpowered by the scent of Black Ice. Now, you should know that this car freshener doesn’t last too long – at the most, you will be able to use it for about 10 days. However, because it comes in a six-pack, you should be sorted out for a few months. In that sense, it does offer good value. This car freshener, too, eliminates rather than obscures the smells in your vehicle. Because of this, it works well for more potent odors such as smoke and pet smells. The freshener has the added bonus of having a rather nice, Hawaiian scent. 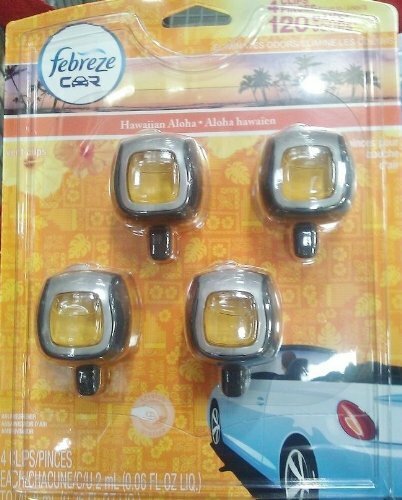 So, your car will smell like you are on a vacation whenever you are in it. You should know that it does give off a rather sweet smell that may not be for everyone. Now, most car fresheners are either bulky or difficult to secure inside your car. This is not a problem that you will face with this freshener though. It has a car vent clip that allows you to secure it to your air conditioning vent. Due to its small size, you will barely even notice it. Despite being fixed to the air conditioning vent, you can still adjust the strength of this air freshener’s scent. So, you can either increase it or lower it, depending on the odors that you want to eliminate. One of the major flaws with this car freshener is its lifespan. On high, it will not last too long. However, you can stretch it out a little, if you continue to keep the setting on low. Fortunately, there are four clips in each package so you can use it for a while. Let’s face it, it’s perfectly normal to not want to clog your car up with chemicals from traditional fresheners. Of course, this does mean that you will need an alternative and this is where this purifying bag comes in. So, how do these bags work? Well, they contain carbon activated bamboo charcoal which absorbs the surrounding offensive smells. As a result, you are left with a fresh-smelling vehicle that is free from cigarette smoke, pet smells, and more. These bags do work better in small spaces, though. So, if you have a larger vehicle, you may need to place more bags around the interior. Yet another perk with this purifying bag is that it helps to prevent the development of mold or mildew in your car. This is because it absorbs moisture from the air. If you live in a region where you have to frequently deal with a damp car interior, these bags can really help. To add to this, these bags are also reusable – you can use them again and again without having to worry about its potency running out. One last thing that you should be aware of is that these bags don’t add any scent to the environment, they simply eliminate odors. 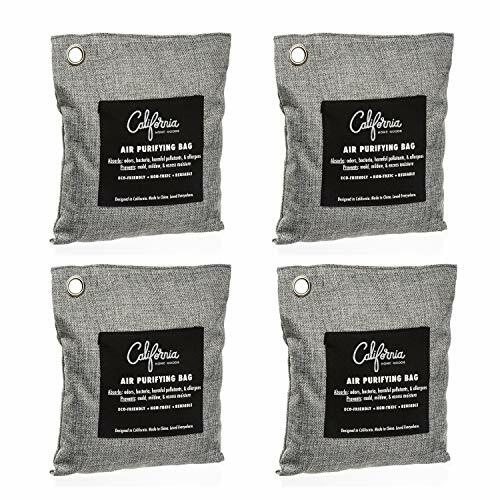 If you are looking for another natural neutralizing option, then this purifying bag is quite good as well. It contains Moso bamboo charcoal. In fact, it could be said that this charcoal is superior to other varieties as it contains a greater number of pores. Due to this, the charcoal (and the bag) are able to absorb a larger number of odors. Of course, you should know that these bags simply neutralize the surrounding air, they don’t actually add any scent to it. However, this is an incredibly effective air purifying bag – it is capable of getting rid of a number of smells including smoke, mildew, and more. At the same time, you don’t have to worry about releasing any dangerous chemicals into the air to eliminate these smells. It is also convenient that you don’t have to keep buying these bags over and over again. See, this purifying bag is reusable. You should be able to use it for up to two years after your initial purchase. This not only saves you some serious money, it is also a more eco-friendly option. To get the most out of them, it is best to use these bags in smaller vehicles. Cardboard Fresheners: these are often the most cost-effective option for car fresheners. They can be hung from your mirror and then slowly diffuse the scent out in this manner. While these types of fresheners do help to keep your car smelling fresh under most circumstances, they may not be enough to handle tougher or more persistent odors. Plug-in Fresheners: these have to be plugged into a power outlet at the front of the car. The main perk with these fresheners is that they can quickly fill the interior of your car with a fragrance. However, the scent can be quite strong and this type of freshener isn’t recommended for people with allergies. Can Fresheners: these fresheners contain a gel-like substance and emit the fragrance through a slotted top. The benefit of this design is that you can keep the can anywhere in the car with ease. You can also turn the slot to control the scent. These may not be potent enough to get rid of strong, lingering odors. Air Vent Fresheners: these are placed directly on top of the air vents so that the stream of air propels the scent forward. This allows the scent to spread further throughout the car. You can also control how much scent is released as well. Natural Fresheners: these products only use natural ingredients like charcoal and baking soda to eliminate scents. In most instances, these fresheners don’t produce a fragrance on their own and only eradicate bad odors. They are often reusable. Now, one of the first questions to ask yourself when choosing a car freshener is – what do you want it to do? It is only then that you will be able to determine if you need an air freshener or an odor neutralizer. If you simply want your car to smell good and perhaps mask any existing, minor smells, then you should get yourself an air freshener. These emit scents and help the surrounding air smell better. However, they will not actually help to get rid of any odor. Bad smells will have to dissipate on their own. Then, you have the odor neutralizer. This product actually gets rid of odors, typically by absorbing them. This allows you to essentially clean the air in your car. What these products don’t do, however, is to produce a scent of their own. If you have decided to opt for a scented air freshener, then you need to be careful about the fragrance that you choose. Firstly, if you have any sensitivities or allergies, make sure to stay away from the car freshener form of these fragrances as well. Also, it is best to stick with mild and natural fragrances. This way, the scent won’t be too overpowering and you will be able to continue to enjoy it for longer. The other point to consider is how long the car freshener will last. As you may have noticed from our reviews, many of these fresheners don’t last as long as they should. So, there is a good chance that you will need to keep swapping them out every couple of weeks. If you want your car to continuously smell good, then it is best to invest in a package deal so that you don’t have to keep ordering new batches too often. If you want to keep using the same equipment, again and again, you should either look for reusable air purifier bags or opt for a type of car freshener that accepts refills. However, if you want to save money, it is best to stick with the purifier bags. Positioning: when choosing the freshener, consider the area of the car that you want to be deodorized – cardboard, plug-ins, and air vent options are usually only suitable for the front of the car. Specific odors: there are some products that specifically target certain odors. So, if you are looking to eliminate cigarette smoke smell or a pet smell, then you may want to invest in these. Health and safety: it is important to always read up on the components that have been used in the fresheners to make sure that they are safe for you, your kids, and pets to breathe in. So, when looking for a car freshener, make it a point to figure out what type you want, the function you require, the scent it gives off, and how long it will last. With this in mind, you will have no trouble finding the best possible car freshener for your vehicle. Now, if you are looking for a car freshener that will offer you the greatest value for money, then the California Home Goods freshener is the best option. On the other hand, if you want a truly potent choice, then the Febreze Vent Clip freshener will serve you well. 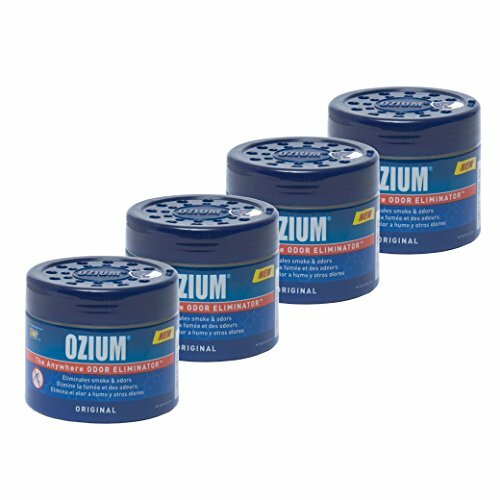 The Ozium freshener will offer you a similar performance. If you are looking for something simple and pleasant-smelling, however, the Little Trees car freshener is right for you. 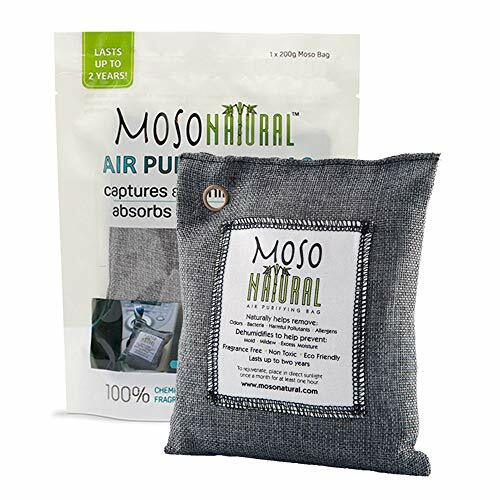 If you prefer a neutralizer rather than a deodorizer then you need the Moso Air Purifying bag. The only thing left for you to do is to use all of this information to find a freshener that will greatly improve the air quality inside your vehicle.